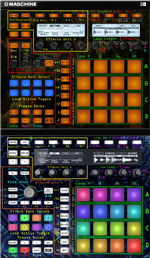 The Mapping is for the Maschine MK II (not Mikro), featuring full 4 deck support. You can control all track decks with 8 cuepoints and remix decks with all 64 samples. 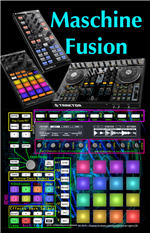 Full color support (not for remix decks yet, since Traktor does not support it) - cues light up blue, gridmarkers white, loops green... Control Filter, Phase, Position, Key, EQ and Volume for each deck. Read more in documentation. A simple mapping giving you access to basic features of the Remix Decks like Volume,Filter, Play Mode etc. 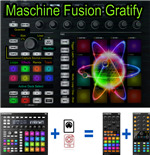 The Ultimate Full-Control Maschine mapping! Works with 2.6.1, 2.6.2, 2.6.3! 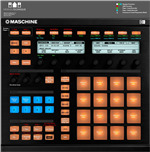 Maschine 2.6 - Ultimate Mk1 and Mk2 full control mapping! outdated - get my 2.6.1 version of this mapping! **UPDATE** 26/01/12 Now includes the controller file that I missed out! Please download the latest version!!! Please note the file contains two mappings, please use MK1 mapping for now, the MK2 mapping is missing the .ncm file which i'm working on still! This is my personal 4 Deck Mapping. I use the Maschine while my partner Spins with the Kontrol S4. an intuitive mapping to use in coordination with another Controller. However: this could be used as a sole Control for Traktor. PDF Dateien sind erstmal für Deckcontrol fertig. der Rest kommt noch. Am besten auch das Layout laden.... ist darauf abgestimmt. This is a mapping to control the new features of Traktor Scratch pro 2. Fixed modifier issues when saving and loading. Added: LED feedback for sample play. The 16 Giant Pads are perfect for two decks 8 Cue. The LED Screen allows more detailed function and info such as LOOP Count.